Windeye is a setting of a short story by author Brian Evenson for video and solo violinist/vocalist. Through her performance, we are presented with the fading and distorted childhood memory of a sister who disappeared under mysterious circumstances. 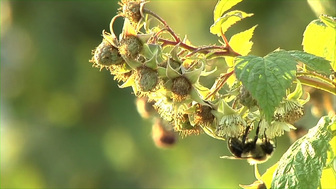 The piece was commissioned by NYC-based violinist and vocalist Andie Tanning Springer. The (unfinished) Ballad of Adam and Elena Emery is an evening-length, multimedia performance piece based on a Rhode Island murder story from 1990. It is a performance setting of fragmented details of this tragic event for four dancers, nine musicians, and multiple interactive multimedia installations staged in various rooms of a five-story church in downtown Providence, Rhode Island. 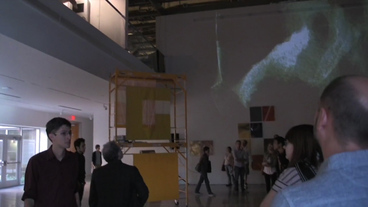 It is a “roving performance” in which the audience and performers freely move between installation spaces and performance scenes scattered throughout the building. An exploration of the relationship between images, sounds, textures and characters found in three locations at Fox Point in Providence, RI. Meridian Project is an ongoing collaboration between musicians, visual artists, and scientists whose goal is to present topics of cosmology, astronomy, and astrophysics in unique audio-visual performances that blend the scientific concepts with new music and imagery in a way that is informative, engaging, and fun. Our performances take place in locations that reflect this mix of science, art, and wonder. 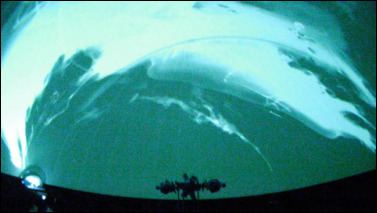 These include planetariums, observatories, and outdoors under the stars. My role in the collaboration is as co-composer, musician, and producer of various video content and experimental projections based on the performance venue. A collaborative media and performance piece for two singers, alto flute, bass clarinet, trombone, percussion, and movement in a building-turned-instrument. My role was to create a responsive audio/visual system that used computer vision to measure movement and spatial relationships between dancers performing in the piece, and used that data to affect sounds and images projected elsewhere in the space. Made possible through a grant from the Dunwalke Foundation. Pretty Polly is a multimedia setting of a murder ballad that traces its history back through the American bluegrass repertoire to England/Scotland. Although the song has been sung to many melodies over the decades, the stark brutality and remorselessness of Willie, the song's narrator, has remained the same. 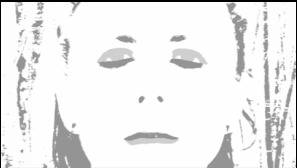 In this new version of the old song, I have set Pretty Polly to new music for double bassist/vocalist (solo performer) and live processed video. 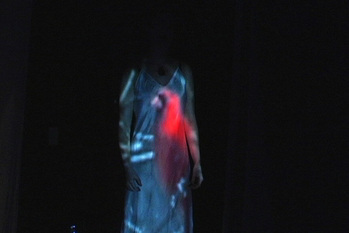 Live video of the performer's movements as she performs are processed through a Max/Jitter program and layered with effects, and then mixed with pre-edited video footage. The performer's instrument, voice, physical gestures are all combined to create a multi-sensory retelling of this gruesome tale. 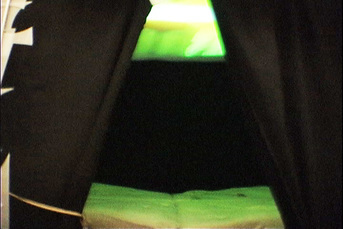 The Haptic Theater of Cruelty was a collaborative group of six artists, who made an installation piece involving large-scale sculpture construction, as well as the design and construction of the Dream Arbitrator: a large, interactive bed housed in a black tent, which uses pressure sensors in the bed to trigger different sounds and projected video images in relation to the movement of people on the bed. My primary role in the group was in construction of the Dream Arbitrator, building its structure, and wiring the many force sensing resistors in the bed, as well as collecting images and sounds to be used in the playback, which was processed and controlled using the Max/MSP/Jitter programming language. I also served as producer: working on the project budget and ordering and organizing the materials used. 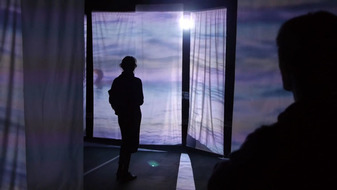 The Haptic Theater of Cruelty was funded by a generous grant from the University of Michigan GROCS (GRant Opportunities[CollaborativeSpaces]) group. This piece was inspired by a folk song of the same name, as well as my recent relocation to Rhode Island, the Ocean State. The original song was a "halyard shanty" which is a working song used when hoisting the heavy topsails of an old tall ship. I am fascinated by both the coordination and fleet-footedness needed to control large sail ships as well as the combined feelings of excitement, fear, and peace experienced when being on the water, pushed along only by the wind and currents. This piece presents and explores a character, played by the performer, who both creates and controls the sea he or she travels by. It is of course a fantasy. 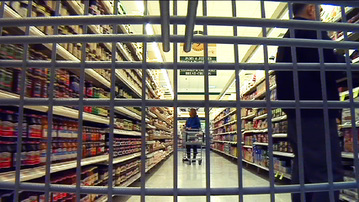 A multimedia setting of a short story by Joshua Ben-Noah Carlson about a strange and intriguing man who spends his spare time musing at the grocery store. Man Without A Shadow is an old folk tale set as a multimedia puppet show in which a man sells his shadow to the devil. The story is based on the novella The Remarkable Story of Peter Schelmihl by Adelbert von Chamisso. Edited video images I shot of elk in the wild in Northeast Michigan are projected directly onto the musicians and their large instruments as they perform. I controlled the playback of three video channels live in performance to be able to react to the particular timing of the performers. My aim was to recreate my dumbstruck awe in presence of these beautiful creatures, similar in my mind to the reverential images of animals placed in the dwellings of man in his early history. Winter Suite comprises three pieces for dancer, sound, and images in which the character of a young woman explores many different landscapes (both real, imaginary and/or subconscious) looking for answers in the cold, vibrant backdrop of winter. She is aided by strange people, creatures, and little things she finds along the way, including some Viking rune stones and a bright red, poofy hair clip. 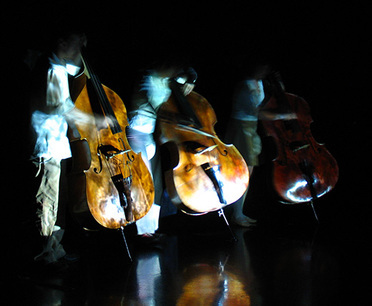 The Max/MSP/Jitter programming language is used to control live image processing during the performance. 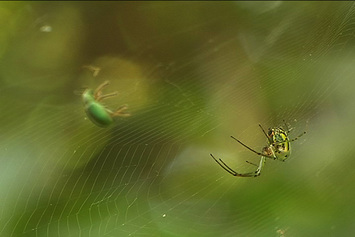 This piece is a multimedia setting of the poem of the same name by e.e. cummings. I have always loved this poem and wished to use it as a narrative on which I would mix music and moving image together in a performance setting. 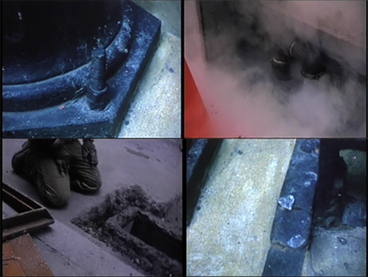 The music for trombones and voice was composed along with the editing of various film images shot in an alleyway in downtown Boston–a space I became fascinated with while location scouting around Eastern Massachusetts. In focusing on this space, and exploring all its nooks and crannies, I hoped to portray the love story between anyone and noone not by their direct representation as characters, but by their absence: that this love affair may have existed, maybe here in this place, but was brief and is now gone.